Abigail thinks she is quite the comedian these days. . .always doing something to make Zach and I giggle. 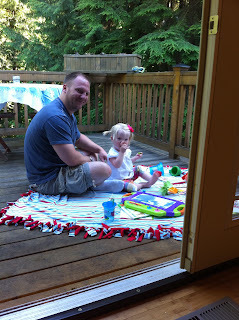 She is also really growing up and understanding more and more every day. 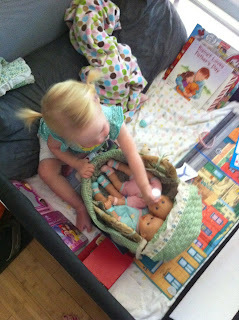 Just the other day I pulled out her dolls and she just started to feed one w/ the bottle. . .how do they figure that out so early?? I about died--it was sooo dang cute. She gets a bath every night (call me crazy but I'm a "routine" gal). 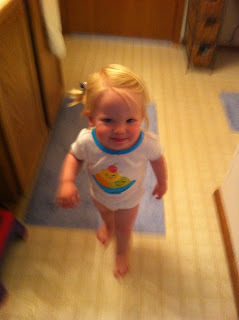 She really likes to ham it up in those last minutes before bedtime. I've started to clean out the office in preparation for it now being Ty's room. I moved the bookcase into Abby's huge closet and moved this out. I can't believe she used to be small enough to sleep in this every night. Now she just thought it was a "ride". :) Since we've been seeing a little bit of sun I've tried to take advantage of getting out in it. Here is a cute shot of Abigail w/ Daddy having a before dinner snack and playing on the deck. Abby likes to try everything we eat so she is eating a sugar snap pea. . .well I actually think she has a few in her mouth. She likes to stuff her face and take about a 1/2 hour to finish a bite. . .and she WON'T let us take it out of her mouth so we just have to keep an eye on her and make sure she is chew, chew, chewing. :) Oh her sweet piggies! I can't believe she has enough hair for these. I love it! 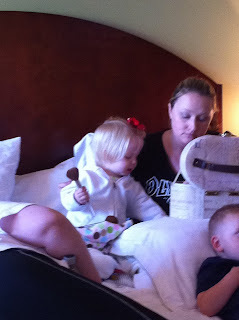 The first time she got the piggies--from Aunt Amy! 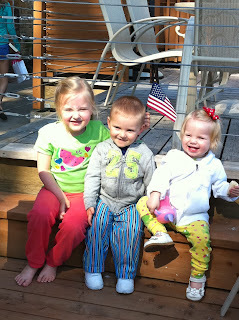 We were at Grammy and Boppa's so we got lots of time with cousins, aunties and uncles--it was so much fun. 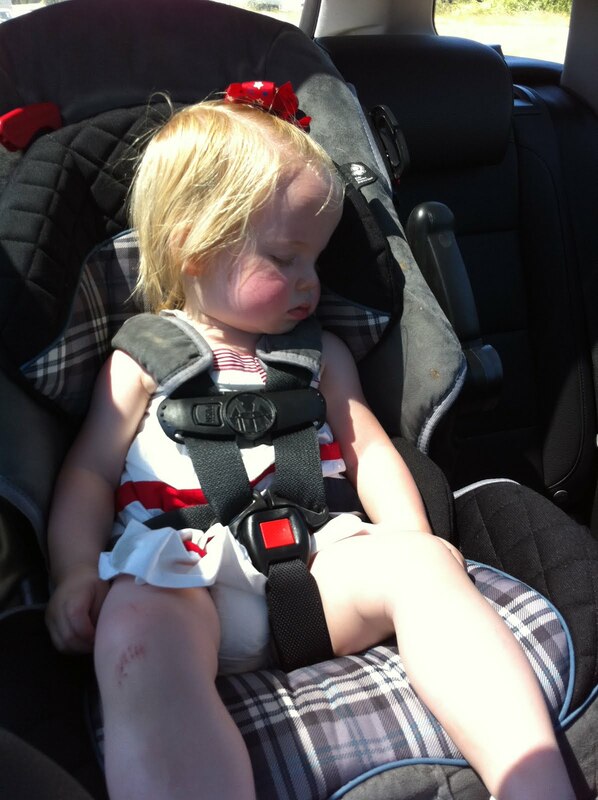 I just want to squeeze her every time I look at this picture. 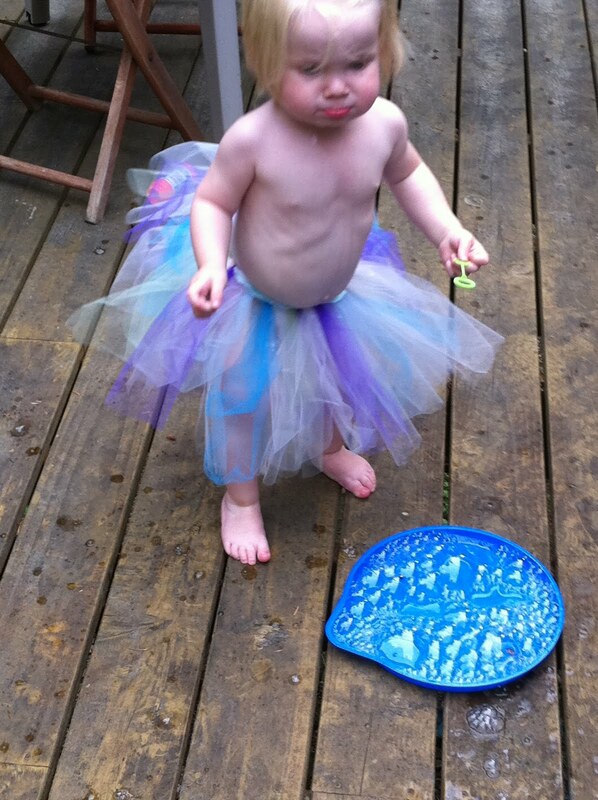 Abs LOVES bubbles. . .and wearing her tu-tu from Aunt Amy! Here she is trying to blow a bubble. Seriously, the bubbles are saving me right now. I can say "let's go do bubbles" whenever I am trying to get her inside from the front yard where she usually tries to play and escape next door to visit Shasta, Quinn, Boo and Carol. 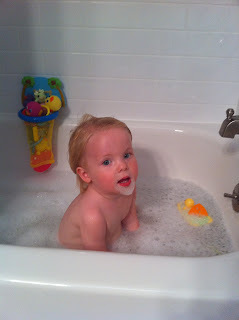 :) More bubbles--she loves them in the bath too. . .in fact she enjoys trying to eat them which in turn makes a goatee on her face. Hilarious. 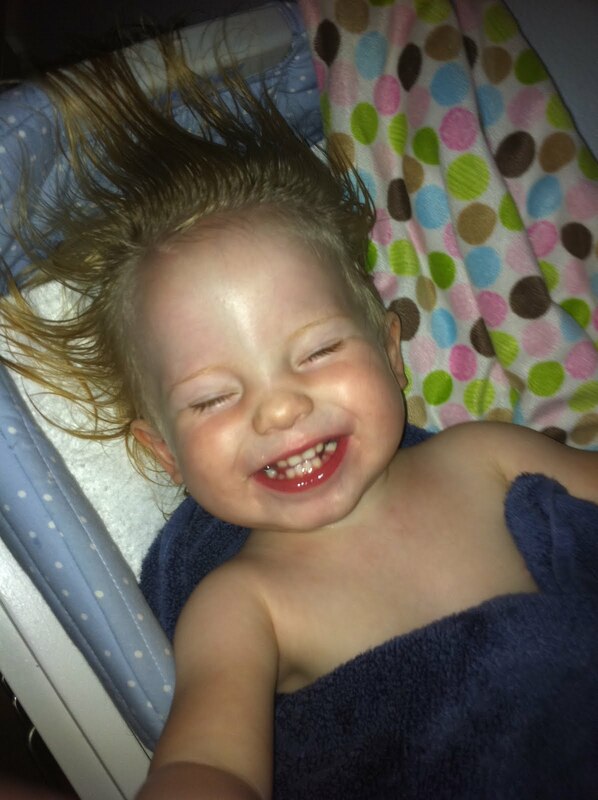 She has taught herself to scoot to one end of the bath now and then she sorta slips on her buns down to the other end like a slip n slide--all while saying "weee". Such a silly girl. I don't think I've ever giggled and smiled as much as I do now. 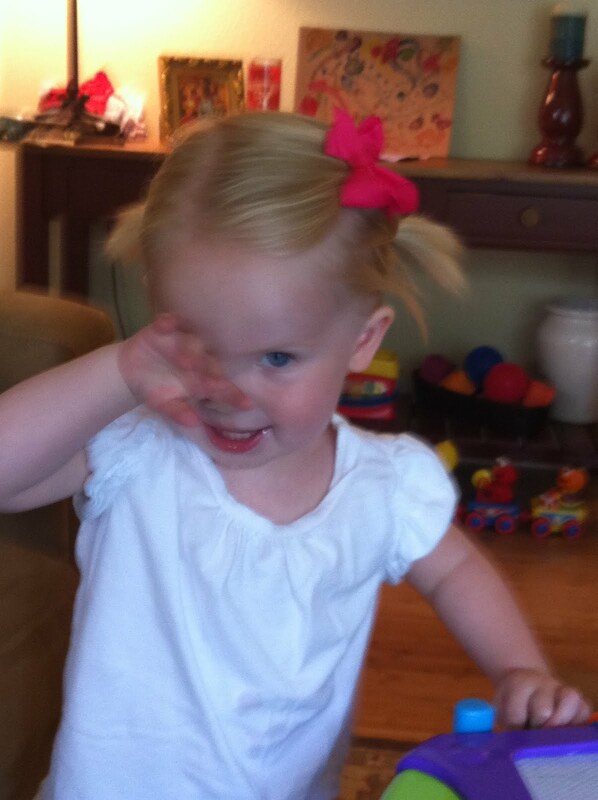 This girl can tire me out but gosh I love her little personality. I lay in bed every night and can't help but laugh thinking of all the silly things she has done that day. 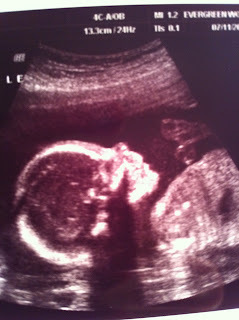 Meet Ty Alexander Wyckoff. . .a.k.a--Baby Dubs. 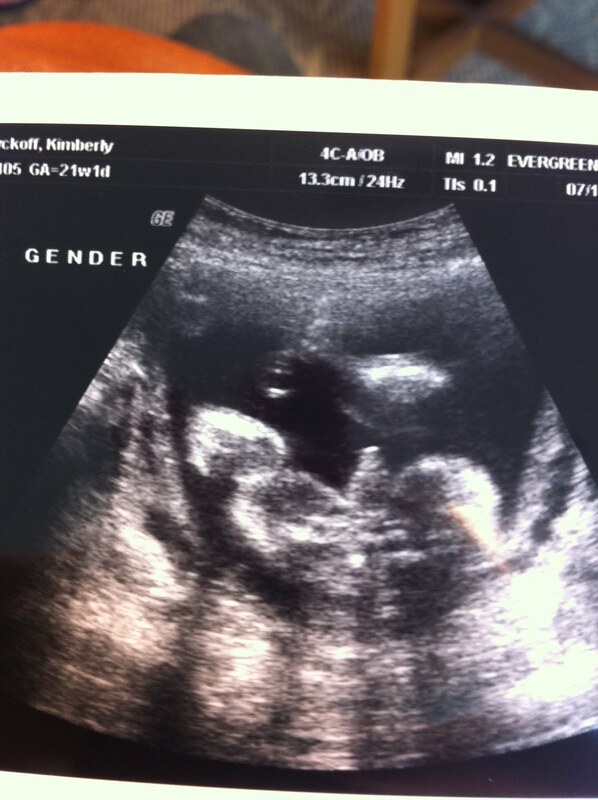 That's right, Baby #2 is a boy. We are just soooo excited!! Here is the money shot showing everyone the goods. :) The thing sticking straight up towards that bubble. . .yah--that's what is telling us BOY. The technician said if she is wrong on this one she is hanging up her probe. And a cute little profile shot of Ty. Everything measured normal. Heartrate was 150. Right now they are actually measuring Ty a little ahead of schedule with a due date of Nov. 18th although they will still keep Nov. 20th as the actual due date. Doc will continue to check my cervix at each appointment to see if I could be at risk of a pre-term baby again. . .she also said 2nd babies and boys are generally larger so heck, I'd go a little early if need be. :) Now on to planning Ty's room. hee hee--I already think I have bedding picked out! 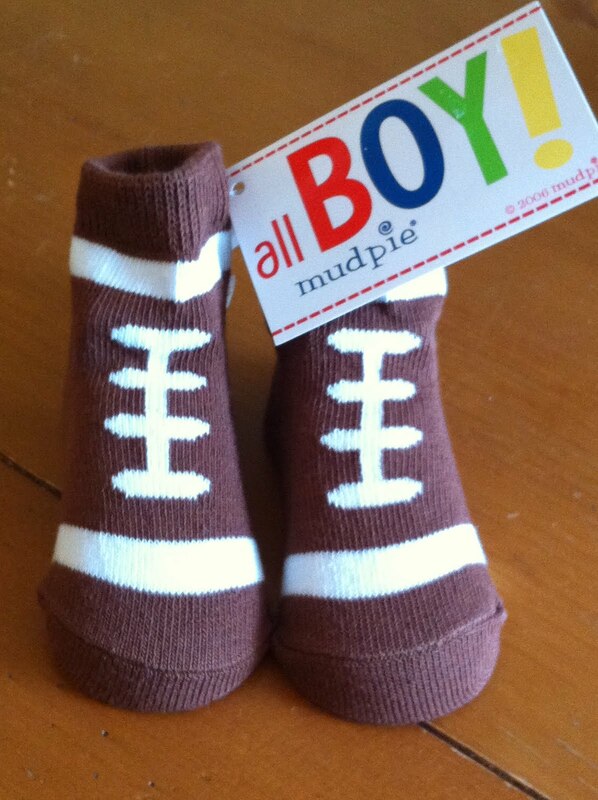 It's going to be so fun getting boy stuff now. 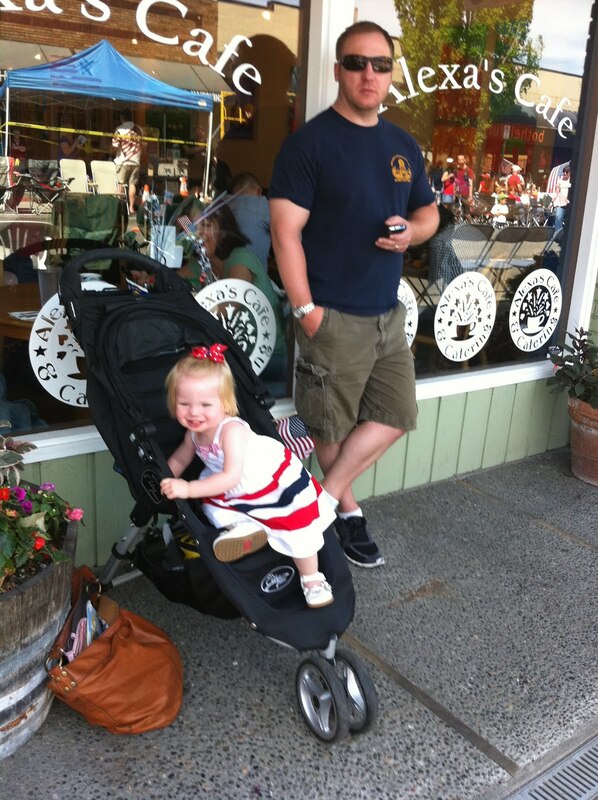 I know it's a little past due but I have such cute pics from the 4th of July weekend that I had to post!! 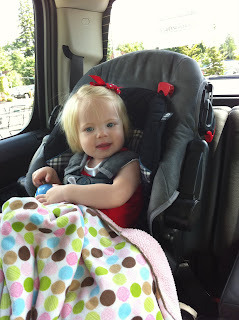 Here is Abigail in our new truck on the way to Alderbrook Resort & Spa for the "Thunder on the Canal" firework show. She loves sitting up higher on the road and being able to look out the windows. The fireworks were AMAZING--we've already booked our stay for next year! 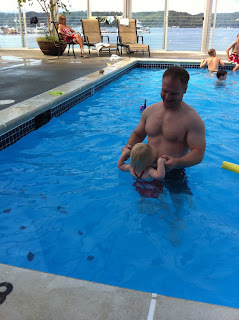 Daddy was so excited to take Abby swimming in the pool and Abs LOVED it. She didn't want to get out. I took her swimming the next day too so she got quite her fill of pool time. 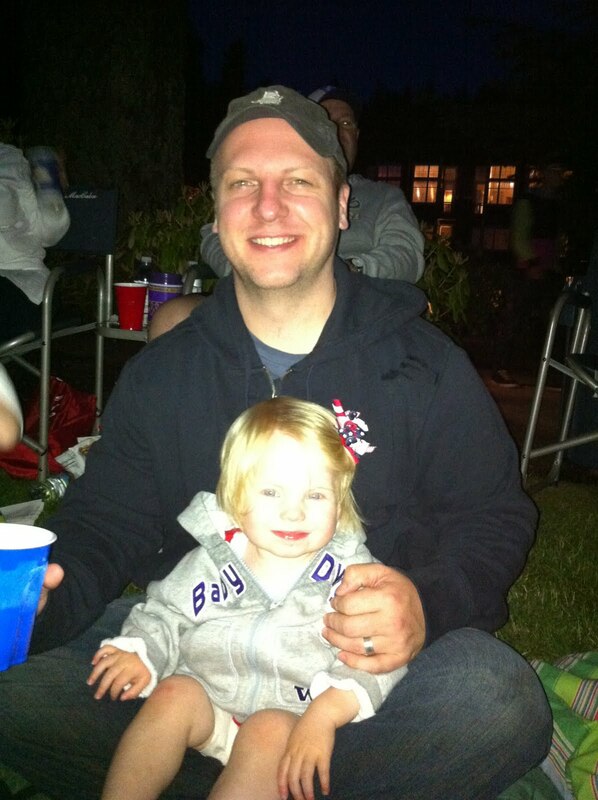 Abby's first firework show--this is the latest she has ever stayed up, 11:30pm!!! This in turn lead to a 4 hour nap the next day. Zach was able to play golf and I got a massage in on our little vaca--sooo nice. 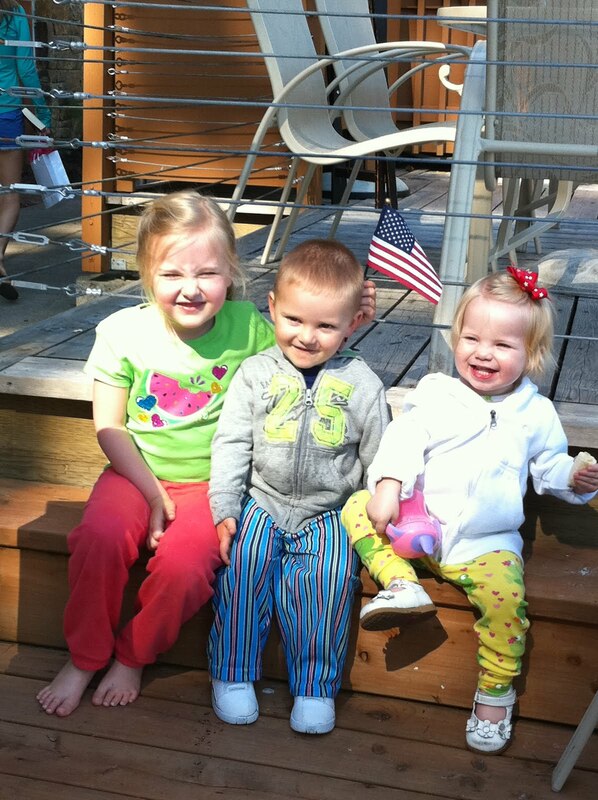 The cousins enjoying a morning stroll in their jammies. 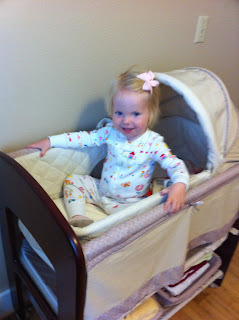 Don't we all wish we could just hang in our jammies like that?? :) Abby was very excited to join Aunt Amy in putting on some make up. She just LOVES getting pretty. 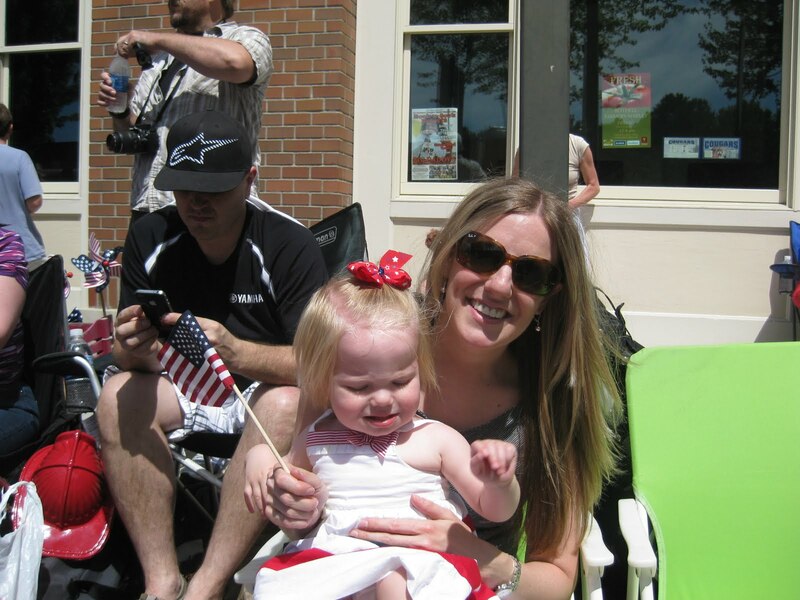 hee hee The 4th of July parade in Bothell. It was cute but waaay too hot so we ended up leaving early. This is Dad and Abs waiting to be seated for lunch before the parade. Me and Abs basking in the sun watching the parade. And this is how the 4th of July ended--Abs zonked as soon as we got in the car! 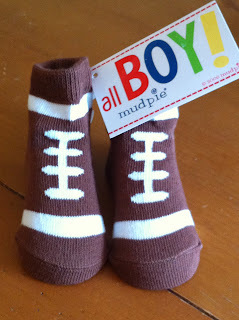 Stay tuned for my next post which will be to tell you all if Abigail will have a little brother or a little sister. We find out in a few hours--can't wait!